Cas Russell is good at maths. Really good. As in calculating where to apply to correct amount of power to kick a chair so it causes maximum damage to the person standing in front of it good. As in working out the trajectory of bullets as they are fired so they don't hit you in leg good. Which is useful for somebody working under the radar as a freelance ... retriever. But while maths can be really useful, it's not the best defence against somebody who can read your mind and implant thoughts in it. So when Cas finds herself up against said telepath, she not only has some nefarious schemes to scupper, she's also got to be sure she's not unknowingly helping them along. 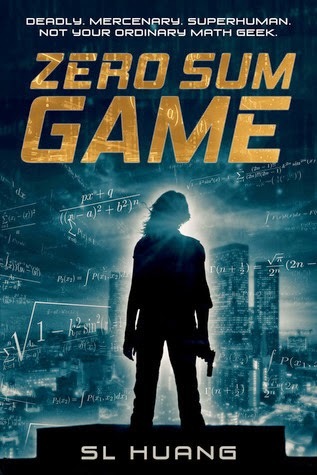 Zero Sum Game is the debut novel from SL Huang and it's pretty good. Not only does it feature a main character who manages to kick asses while being female, her superpower is maths. Or 'math', because this book is American. The only thing my maths skills have done for me is enable me to always buy the most cost effective bag of dishwasher tablets even when I don't have a calculator. I've heard a lot of good things about this one so I was initially a bit disappointed. The opening was underwhelming - not because it did anything wrong; it read like the action sequence which preceeds the credits of a blockbuster film which was fine and everything, just ... meh. However, by 16% it had me. Cas is a witty voice (I will admit, I slightly want to be her. I want to throw sticks.) and she's joined by a cast who complement her nicely. I especially liked the interplay between her and Arthur - he's a nice (if marginally predictable) foil to Cas's Lone Ranger attitude, a dose of empathy in situations where some things need remembering. The ways in which this could have gone horribly wrong are many and, all credit to Huang, it didn't. When you've got a first person narrator who may not be acting of her own volition you need to get it right and Huang mostly did. The pace keeps things moving forward and it was only towards the end, when that began to slacken, that I felt some minor irritation with a couple of things. While I was reading it, this was on course for 4 stars - I usually have 2 books on the go, one upstairs and one downstairs; if I carry a book to another floor with me, it's a good sign - but the ending is also underwhelming. It's not bad, just weak. Although the book stands alone, it's the first in a projected series (Book 2, Half Life, is out now) and much of what I disliked were the manoeuvres in the final third, the necessary setting-up of strands for future books. Zero Sum Game is a seriously enjoyable read for the most part. It's got a great premise, a main character who does it justice, and a story which kept me reading. If only the ending had been better. 3.5 stars and I'll likely be getting the next book in the future.